Here’s an overview of just a few of the many fine shopping opportunities in and around Tucson. And while you’re out finding the perfect accessory or piece of furniture for your home, don’t be surprised if you run across a lot of other great finds as well. Make a little thyme for yourself at the Magic Garden. Shop a vast selection of roses, fruit trees and edibles, succulents and lush houseplants. Think of the Southwest, and silver-and-turquoise Native American jewelry and cowboy boots instantly come to mind. Mac’s Indian Jewelry in midtown Tucson is one of the best places for the former, and shoppers are never disappointed. Family-owned and -operated for more than three decades, Mac’s meets everyone’s wearable art needs–not to mention many home decor hankerings. When Tucson residents and visitors alike enter Desert Son, at the northeast corner of Swan Road and Skyline Drive, and browse the shop’s high-quality Native American arts & crafts, they can always depend on finding something new. Steve Osborne, the owner of this light-filled Foothills gallery, has an excellent eye and knows many of the artists he showcases personally. Everyone has a different reason to want a custom-made hat, from fashion savvy to head shape, and Optimo Hatworks Milliner and Renovator, located 90 miles southeast of Tucson, is the premier place to find them. A bonus: The store is in Bisbee–a cool, funky, and fun place for a day trip. With a combined 50 years of jewelry experience, Cindy and Malcolm at La Jolla Diamonds and Gems can bring your jewelry visions to reality, and can work with any budget and any time frame. Located in Josler Village, you can select your next accessory from the vast selection in-store, or create your own custom piece. La Contessa has adorned women in choice fashions since 1985. Located in Plaza Palomino, the shop has a loyal local following and is a favorite among visitors as well. The La Contessa team has a passion for sharing their expertise and making sure every customer is given tailored guidance. It’s more about being real with the customer than making the sale. Whether you’re a fashionista looking to make a big impact or simply someone who appreciates a good outfit, stop by La Contessa for a shopping experience that fits just right. This charming Mission-style complex hosts a Japanese restaurant and a number of interesting shopping experiences, from south-of-the-border finds and upscale clothing boutiques to a Friday farmers market and more. On Campbell Ave. between Grant and Fort Lowell Rds. This bustling corridor of Campbell Ave. boasts a vast array of shops and galleries offering fine art, handcrafted jewelry, designer apparel and footwear, collectibles, and more, as well as almost 50 restaurants. Northeast corner of Grant and Swan Rds. Find bed and bath accessories, men’s and women’s clothing shops, shoe stores, a cigar shop, an art store, a coffee shop, a grocery store, restaurants, salons, a nail and reflexology salon, a six-screen movie theater, and other specialty stores. Tucson’s first regional shopping mall, El Con houses JCPenney, The Home Depot, Ross Dress for Less, PetSmart, Office Depot, Burlington Coat Factory, Target, Claim Jumper Restaurant, In-N-Out Burger, and Century 20 Theaters with stadium-style seating. On Fort Lowell Rd. between Alvernon Way and Country Club Rd. Copenhagen Imports, Karimi Rugs, Contents Interiors, Mo’s Gallery & Fine Framing, Off the Wall Furniture Solutions, Illuminations, and Alexander’s on Fort Lowell are all located within a three-block stretch and feature top-quality furniture, unique home accessories, and professional design services. You’ll enjoy shopping, fine dining, and relaxing among tiled courtyards and fountains in a hacienda-like setting. Shops include women’s apparel, antiques, an art gallery, specialty stores such as a leather-goods shop, and restaurants. Roughly bounded by I-10, 6th St., 4th Ave., and 15th St.
Find an eclectic mix of sidewalk cafés, bars, vintage and gift shops, theaters, and diverse galleries hosting numerous arts and cultural events throughout the year. This unique, historic shopping district boasts more than 100 shops and restaurants offering vintage and boutique clothing, jewelry, furniture, artwork, antiques, handcrafted and imported wares, and a food co-op. The Fourth Avenue Street Fair is held in early spring and again in December. On Park Ave. just south of Broadway Blvd. This unique row of shops offers an extensive inventory of furniture and home accessories, plus garden and landscaping elements. Concentrating on Southwestern and ethnic styles, the shops carry antiques, reproductions, imports from around the world, and one-of-a-kind items. A pedestrian-friendly shopping and dining destination near The University of Arizona, with more than 50 shops and restaurants, including clothing stores, salons, a bookstore, coffeehouses, pubs, and the Marriott hotel. A public market featuring regional eateries, including a Mexican bakery and taqueria, surround a center courtyard, while local artisans and a posh French restaurant anchor the rest of the plaza. Shop, dine, and enjoy live music along Tucson’s historic Miracle Mile. This beautifully repurposed 1940s motor court offers art galleries and retail shops in a courtyard setting, a café with indoor and patio dining, a performance stage, and an artisans/farmers market. An impressive amount of handcrafted work by local, regional, and Latin American artists and artisans occupies an entire city block containing a landscaped courtyard and a a coffee bar, cantina, and restaurant. At 6530–6548 E. Tanque Verde Rd. near Grant Rd. 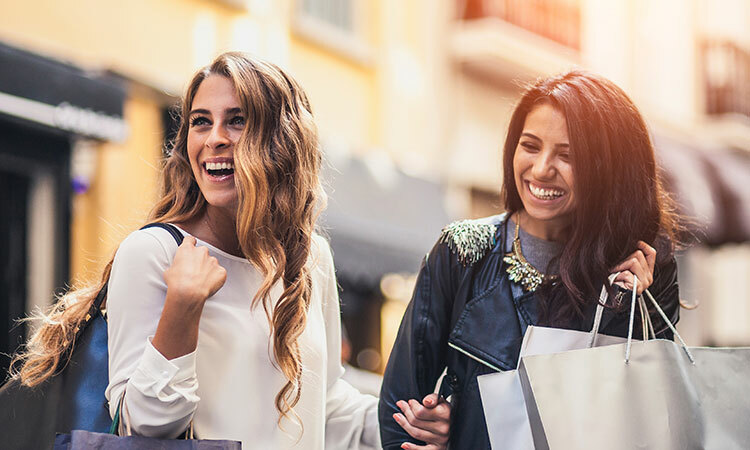 A diverse mix of shopping opportunities, featuring several restaurants, fine boutiques, a stationery store, art galleries, a home decor shop, and a salon. Approximately 150 fine stores, including Dillard’s, Macy’s, and Sears, accompany a food court, movie theater, and a full-service restaurant. Shop at other big names, including Coach, Banana Republic, Ann Taylor Loft, White House Black Market, Aveda, Z Gallerie, and Abercrombie & Fitch. Southwest corner of Broadway Blvd. and Craycroft Rd. In the shadow of Tucson’s eastside corporate and financial center, this sophisticated plaza features jewelry, gifts, frames, footwear, bicycles, a coffee shop, a cake boutique, restaurants, and a nightclub. A replica 19th-century Western street with wooden sidewalks and Wild West stunt shows, a kiddy train, a Ferris wheel and carousel, Museum of the Horse Soldier, and a central plaza with a gazebo. Restaurants include a steakhouse and a café. Specialty stores feature exclusive gifts, including whimsical toys and antiques; period photographs; fine art; home accessories; and gourmet hot sauce, chocolate, and candy. Nestled in the shadow of the Santa Catalina Mountains, this sophisticated plaza offers visitors international cuisine, fine jewelry, designer handbags and accessories, and women’s fashions, as well as salons, a health club, and an art gallery. Southwest corner of Oracle and Ina Rds. This historic Mediterranean/Territorial-style center features premier home-accessory stores, upscale clothing and shoes, and restaurants, plus gifts and natural foods. This mall offers a Saks Fifth Ave. Off 5th outlet plus other manufacturers’ outlet stores, Barnes & Noble Booksellers, AMC Loews Foothills Theatres/IMAX Theatre, an international food court, restaurants, and more. This shopping complex, with architecture inspired by the provincial farmhouses of southern Spain, is home to world-class galleries and shops that offer fine art, paintings, and sculpture. A piano gallery, custom-closet design business, and modern American restaurant featuring seasonal menus round out the mix. Northwest corner of River Rd. and Campbell Ave. This contemporary shopping center, set among tasteful courtyards and fountains, features upscale retail shops, including clothing boutiques, jewelry, specialty shops, five stylish restaurants, and more. La Encantada features high-end shops, including Tiffany & Co., Bebe, Louis Vuitton, and Williams-Sonoma. Choose from a handful of upscale restaurants while enjoying the open-air environment. Southeast corner of Skyline Dr. and Campbell Ave. Located in the foothills of the Santa Catalina Mountains, this center features high-end shops and restaurants, including a hair salon, a clothing boutique, an all-suites hotel, and an American craft gallery. Southwest corner of Skyline Dr. and Campbell Ave.
Reminiscent of the streets of Spanish Colonial Mexico and topped with an Old World-style copper dome, the newest addition to the Foothills includes clothing boutiques, home furnishings, imported rugs, both a “med spa” and a day spa, a gallery, and restaurants. Northeast corner of River and Craycroft Rds. A palm-lined courtyard in the shape of the state of Arizona highlights this Foothills center, which features restaurants, Southwestern gifts, jewelry, craft supplies, a florist, and a salon and day spa, as well as a public library branch. Innovative restaurants and a salon and day spa accompany shops featuring fashions, furnishings, and the arts. The setting is a Spanish Colonial-style outdoor plaza with an all-suites hotel, fountains, tiled courtyards, and lush, colorful landscaping. Tucson’s largest shopping mall features department stores, 200 specialty shops, a play area for kids, and a food court with an international selection.